I quite like the display mat this time. The blending of Tattooine, Naboo and Hoth. It took a little getting used to, but now I love it. What a build to start off with! 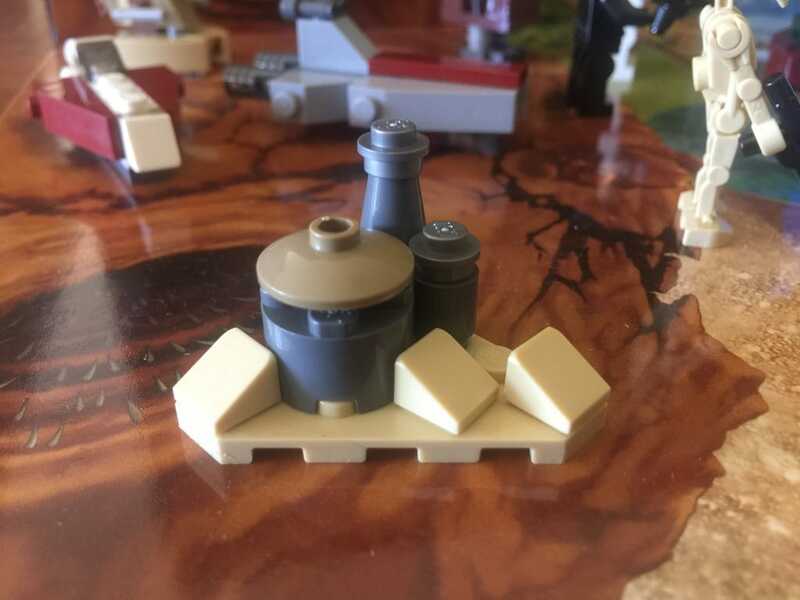 I absolutely love this microscale Slave I. It looks absolutely perfect whether in flight or landed. I’m very excited about this calendar now. This one was a little tricky to build, but that’s most likely just because of the teeny tiny picture. 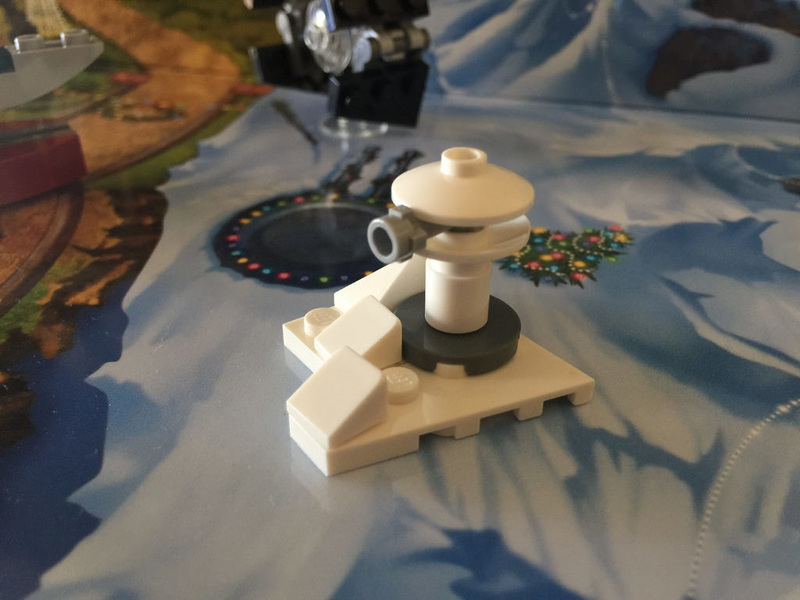 Day 2 is our first minifigure for the set – a Bespin Guard. You would have seen these guys around the place at Cloud City. 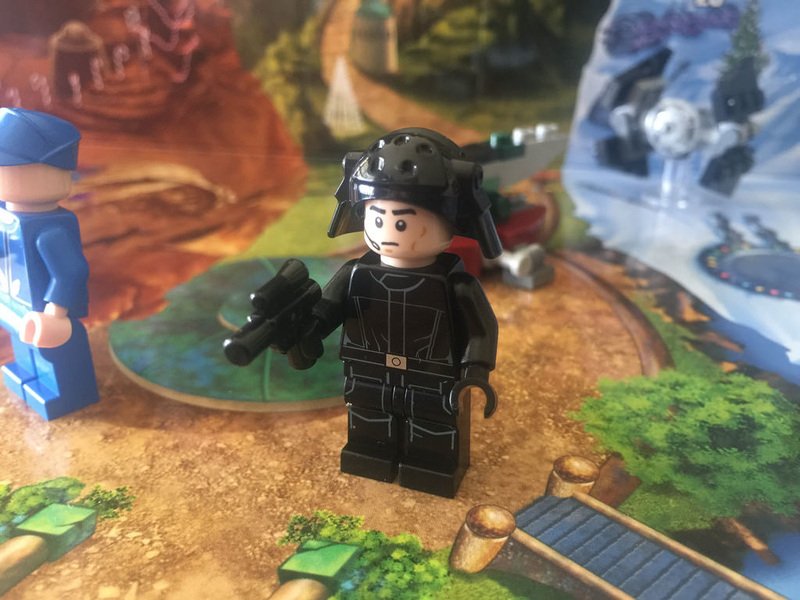 He’s pretty rare – only seen in 74060: UCS Slave I, in exactly the same uniform. 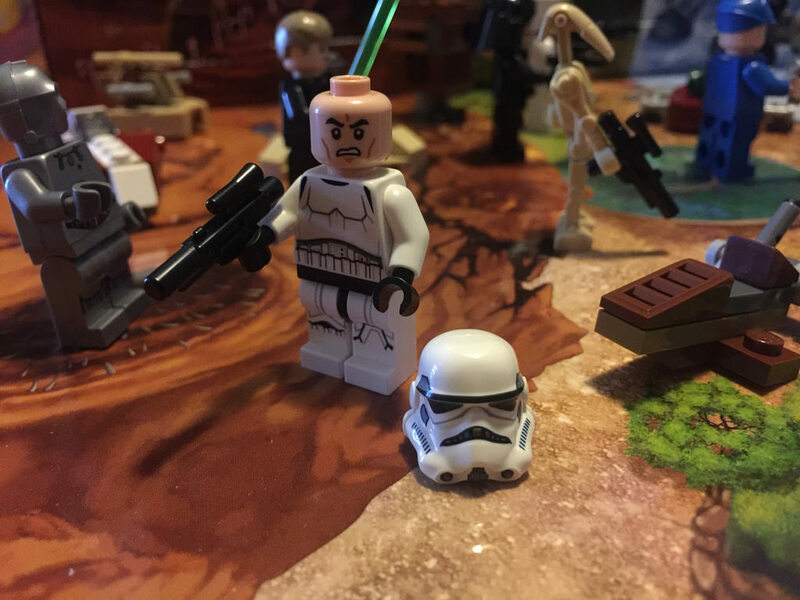 His head was different though. He comes with a spare weapon, although they’re a little uninspired. Day 3! 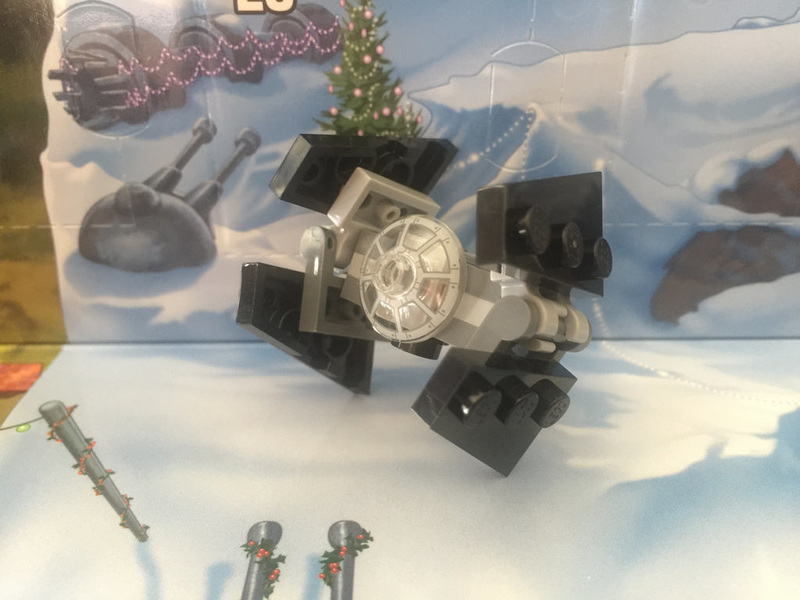 We get a pretty snazzy looking TIE Interceptor, complete with a printed cockpit screen! This one looks great, and is a fantastic addition to the calendar. The inclusion of the printed dish took me by surprise. 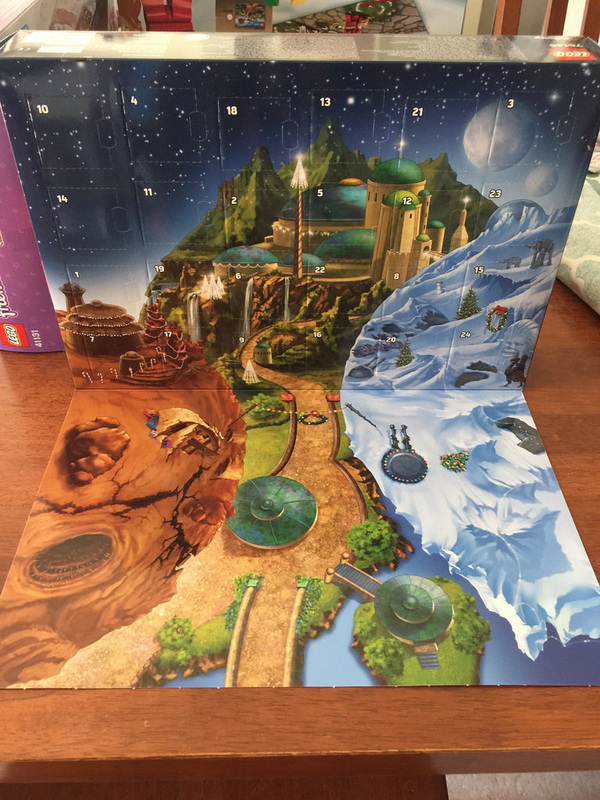 It’s not often we get a printed piece in a Star Wars calendar. It was a bit more of a trickier build, especially with the clips, so kids might struggle with it, but parents can always help! Our wish came true – kind of! 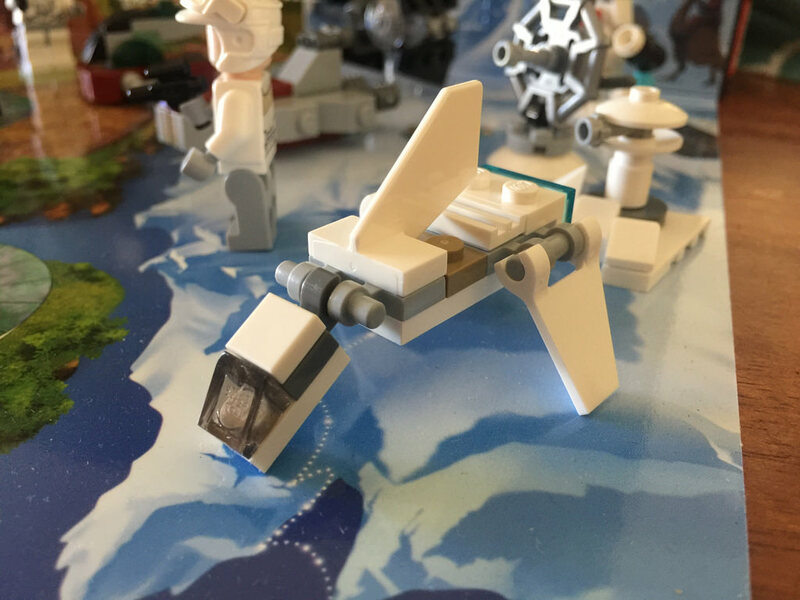 Today we’ve got an attempt at a DF.9 turret from Hoth. It’s not really recognisable, unless you’re a big fan of the Battle of Hoth scene, but it’s difficult to replicate at this scale. Still, points for effort! 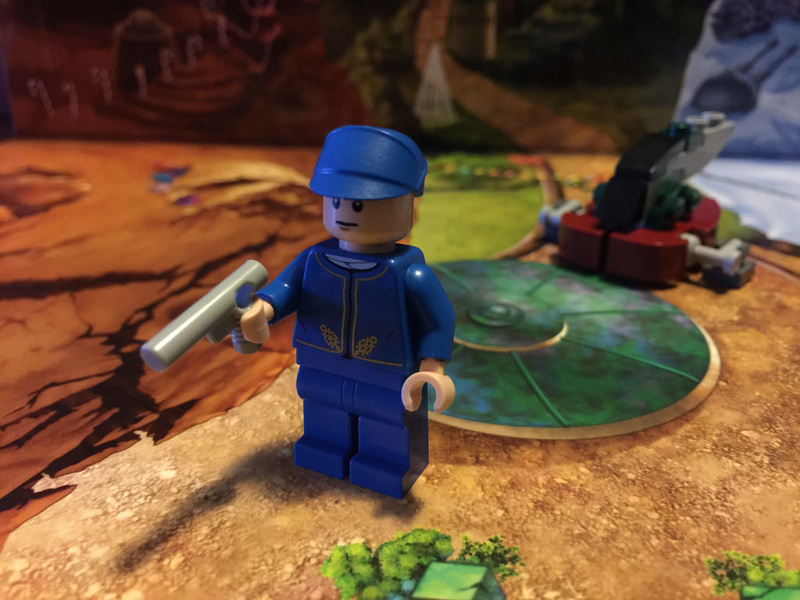 It’s another minifigure today, but it’s a bit more common. 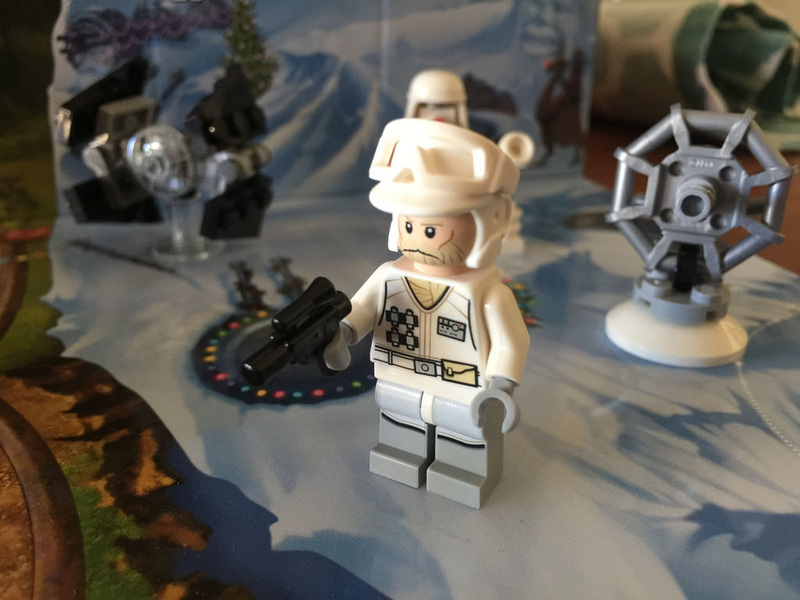 The snowtrooper has appeared in many different sets over the years, dating back to 2003. I’ve not had one until now though, so I’m pretty happy! I like his helmet – the fabric-esque section looks great, and the printing is quite nice too. The backpack has a printed 1×1 tile that looks pretty good too. All in all, not bad! We’ve got a bit of a weird one today. 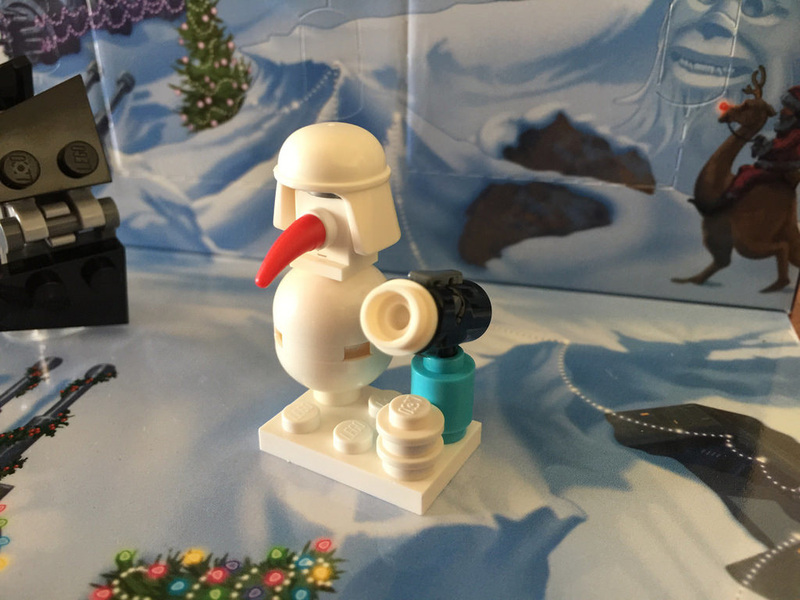 It’s a snowman trooper! The helmet has it’s first appearance in white with this one, which I’m sure many Star Wars fans will be excited about, however I’m not sure about the medium azure coloured 1×1 round brick. It just looks weird. When my wife saw this one, she said “It’s a gas bottle with a helmet on! She’s right! It looks a bit wacky. I initially had no idea what this was. I did a bit of research, and it’s apparently a P-Tower, used in the defenses of Echo Base on Hoth. It’s got a handle on the back so it can be used by a single rebel, so maybe that’s what’s coming up tomorrow? Today’s build is another ripper, and instantly recognisable as a Venator-class Star Destroyer. This build is fantastic – almost as good as the Slave I we saw on Day 1. The colours are perfect, and the shape is great! I love it. This one took me a little longer than usual, but I figured it out. The Armoured Assault Tank (or AAT) was seen driving across the Great Grass Plains on Naboo in Episode 1, fighting the Gungans. I quite liked these as a kid, and I’m glad they got a nod in this year’s advent calendar. 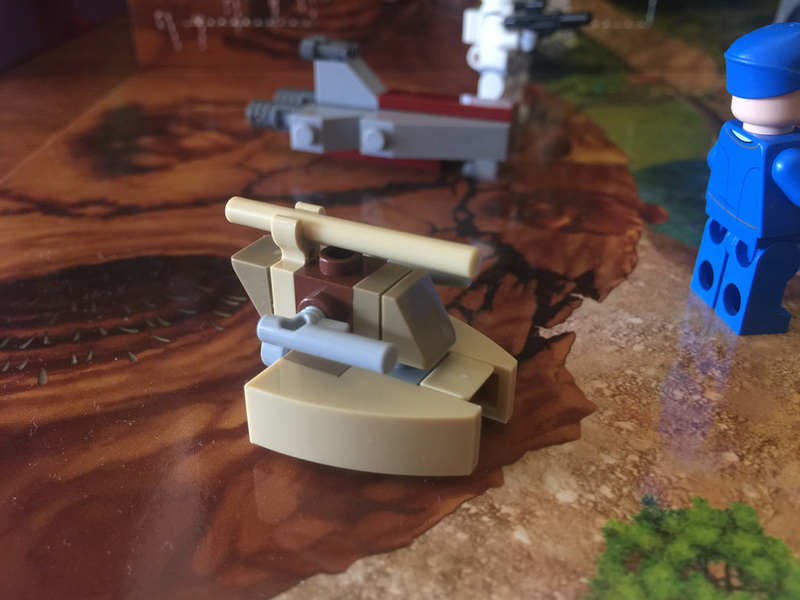 It took a little bit of fiddling around to get the turret right – the dark brown brick has to be upright. There’s a good amount of play in this one too, as the turret can swivel. This set just gets better and better! 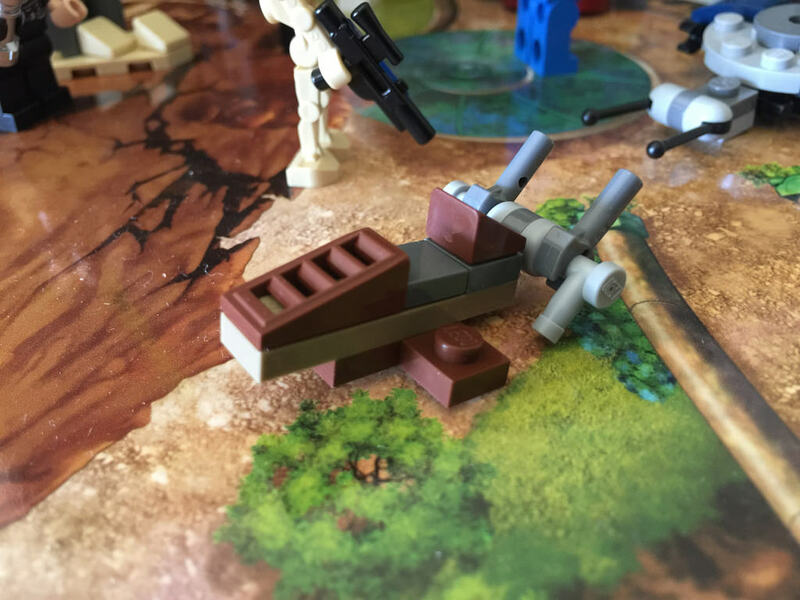 Having never been a fan of the Clone Wars storyline, I had no idea what this was meant to be. I had to look it up on the net to figure it out! The model is a pretty decent representation to it’s movie counterpart, but it’s still a weird one. I’m not a fan of the set today. 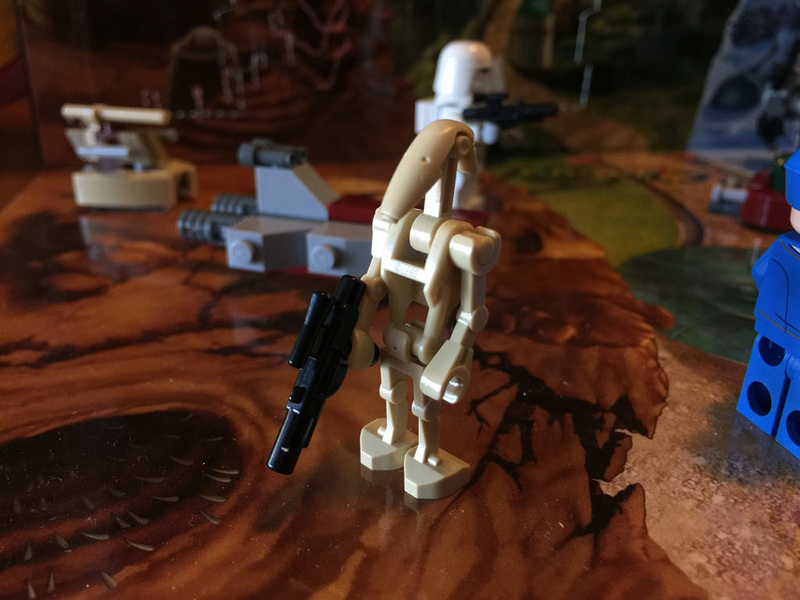 Time for another minifigure, and this time it’s a battle droid. These are the guys running around on the battlefield getting blown up, shooting each other, and generally being cannon fodder. I like him, but for some reason he doesn’t want to stand up when his gun is raised. He does come with two spare arms, so the hands can be spun around. I’ve got one of each on him in the photo. I’m loving how much this set is getting into the microbuilds this year. 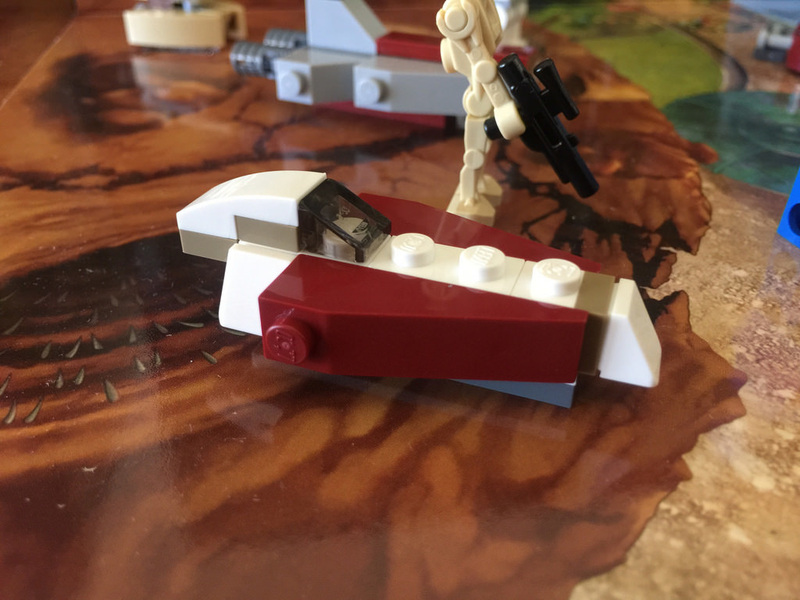 Here’s another great one, with Obi-Wan’s Starfighter. It’s a much more simple build compared to the other micros, but there’s still a good amount of SNOT in there. The colours are great, and it’s very swooshable! Another ship! Hooray! It’s the Tantive IV today, the ship that was the means of transport for Princess Leia when our favourite bad guy Darth Vader decided to stop in for a visit. And subsequently destroy it. 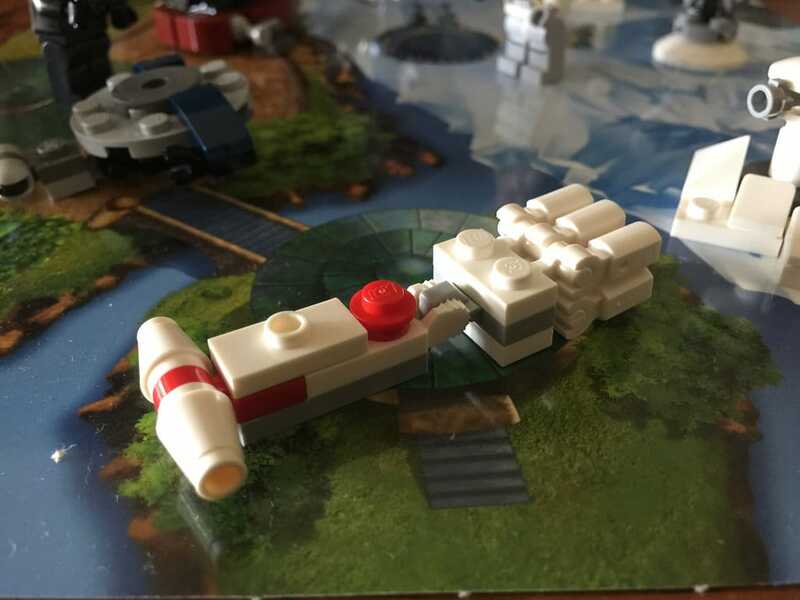 It’s a very unique ship, and is pretty well done at this scale, but with one modification. This model has six thrusters, where the ship in Episode IV has eight. Either way, it’s brilliant. Bring on more ships! 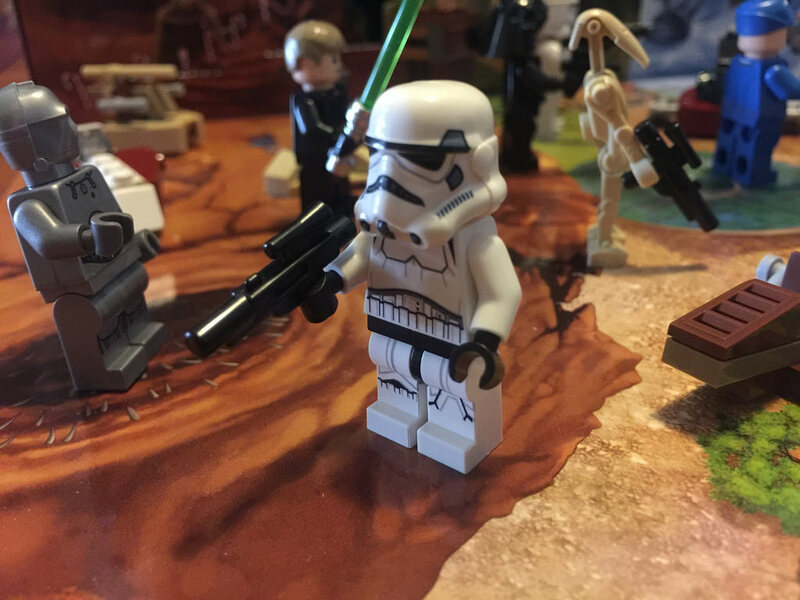 It’s taken us to Day 16, but we’ve finally got our first brand new Star Wars minifigure. 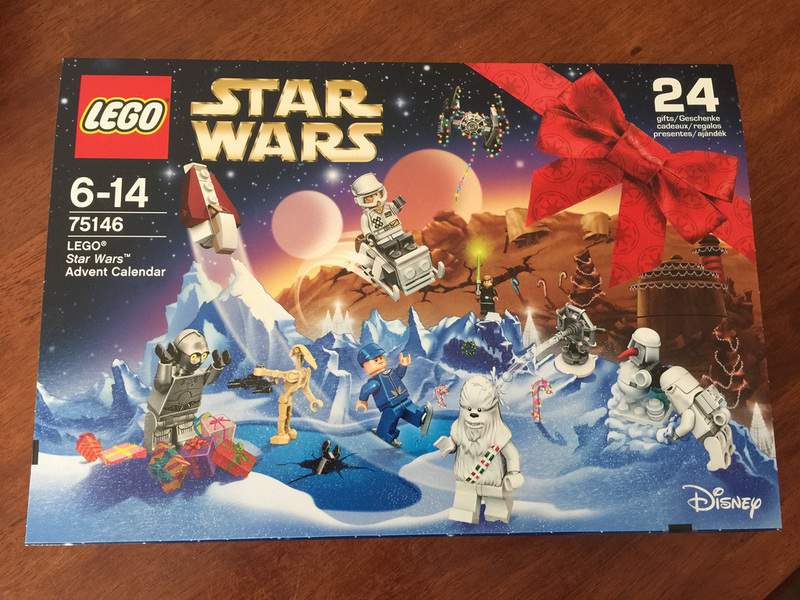 Each year the Star Wars Advent Calendar gives us a special one, and this is it – E-3PO! Nope, it’s not a silver C-3PO. These guys were much more rare and very pricey for the owner, so it’s a good thing we’ve got one! I love it. The printing is very nice, as well as the back printing, and the head mould is brilliant. Now C-3PO has a friend. 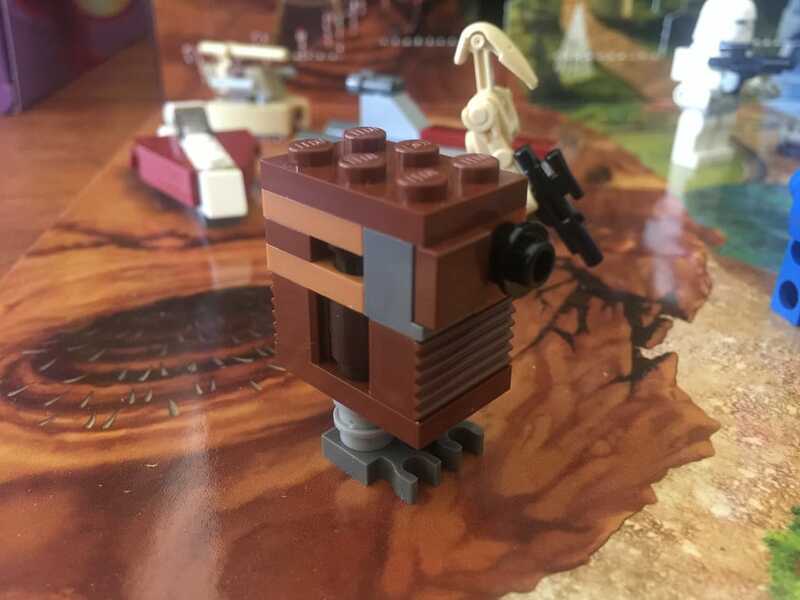 This funny little guy is the GNK Power Droid, otherwise known as the Gonk Droid. It’s the weird looking slow walking plastic container thing first seen in Episode IV. It’s very hard to get the right shape at this scale, but they’ve done ok. It’s the funny (and perfect) legs that sell it! Man this set is good this year! Here we go, the final week of the Advent Calendar! Today we’ve got a very swish looking Luke Skywalker straight out of Return of the Jedi with his rather rare torso. 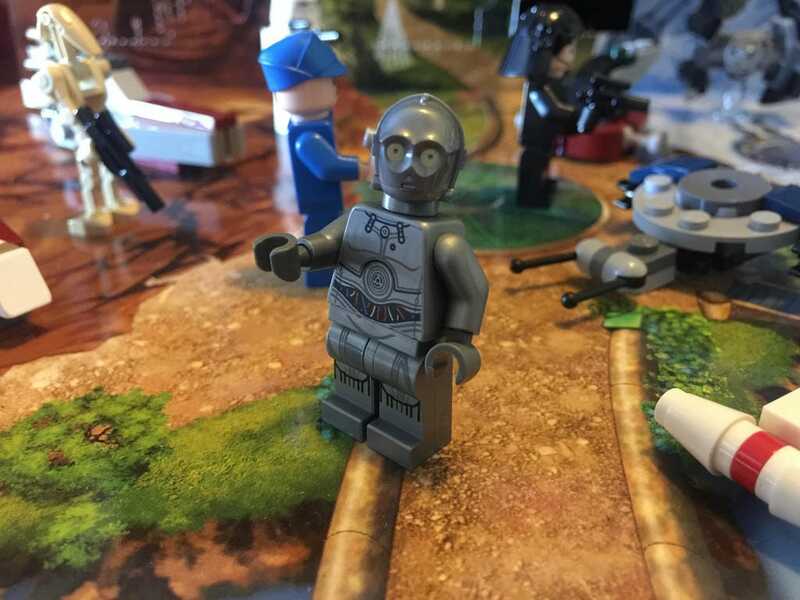 This has only been seen in two other Star Wars sets, including the latest Death Star, 75159. Not everyone can afford that one, so it’s a very special torso to have, complete with his black gloved robot hand. He’s also got a double sided face. Great inclusion today! Today is a little confusing. 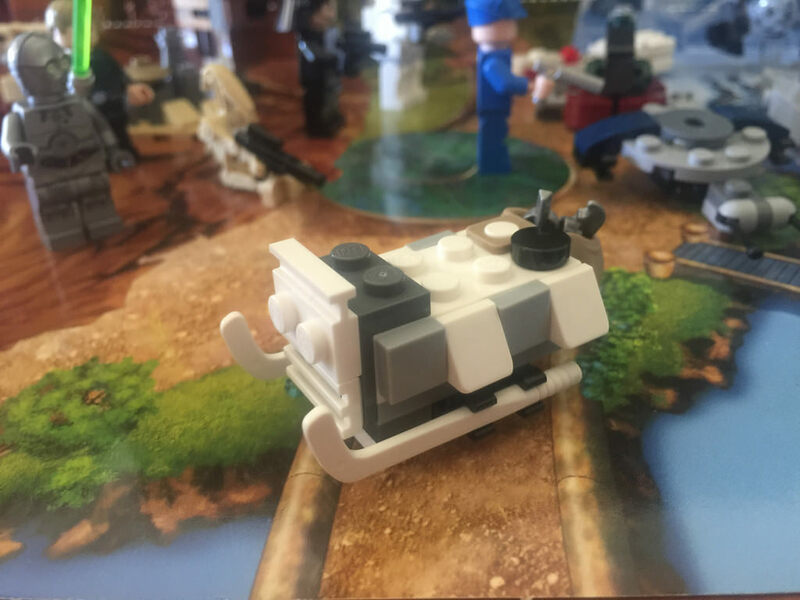 It’s meant to be the desert skiff that rescues Leia from the hands (?) of Jabba the Hutt. You know, the craft that hovers above the Sarlacc? Yeah, that one. It’s very hard to figure out at this scale, but the shape is sort of there, as well as the plank. It’s tricky though. Nice attempt, but not quite. 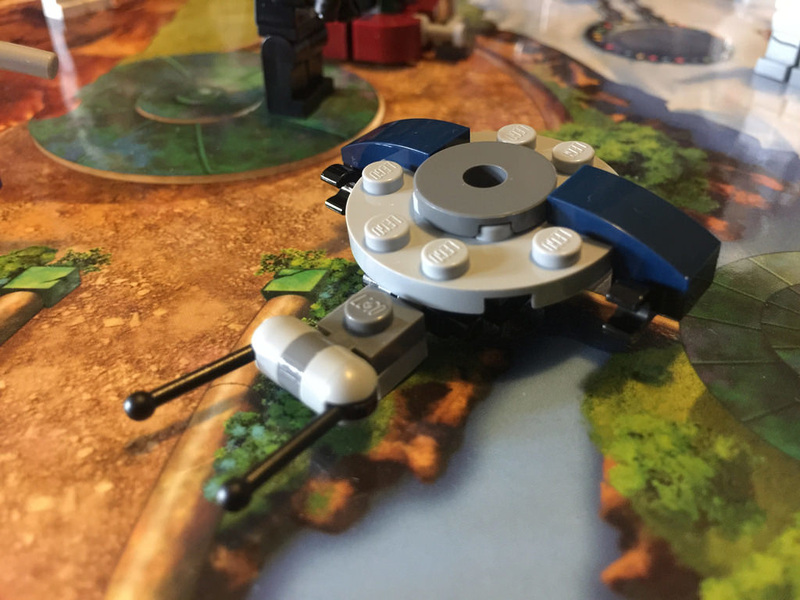 We got another spacecraft today – the Sentinel-class landing craft. It looks very similar to the Imperial Shuttle well loved by fans, but this is definitely not that. It’s actually a quite accurate representation. I’m not sure about the darker 1×2 plate in there, but the rest is good. I really like today’s build. It’s a Star Wars esque sleigh! There’s also items for a galactic hockey match, including two sticks, a puck and some skates. I think it’s brilliant! It’s not from a movie, but it doesn’t matter. It’s fun, funny and perfect. One day left! It’s December 24, so that means the Advent Calendar is over. 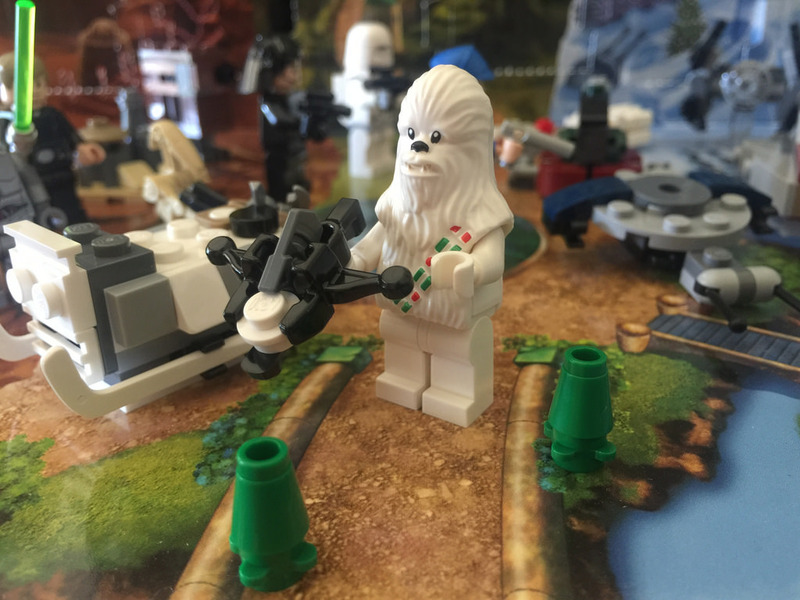 Today’s final build is a snow wookie. 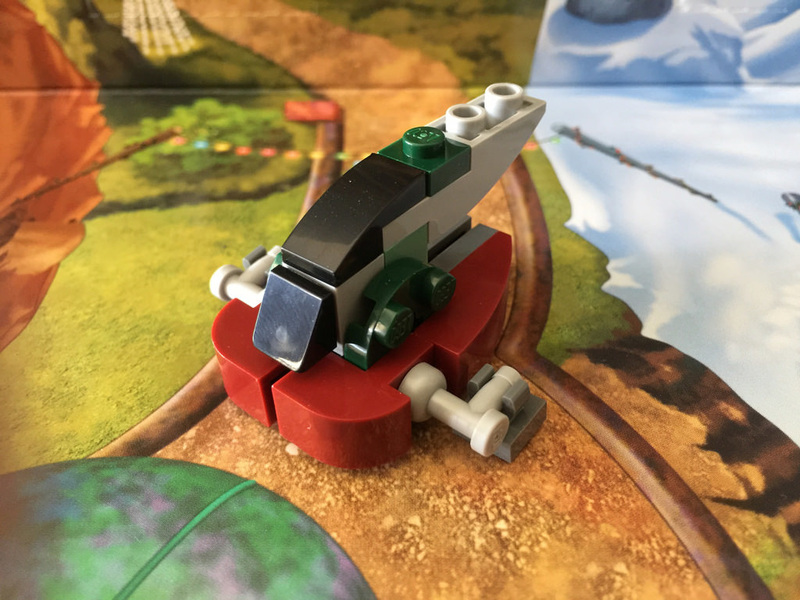 This is another of the unique moulds for this set, and he’s quite festive with his red and green bandolier. 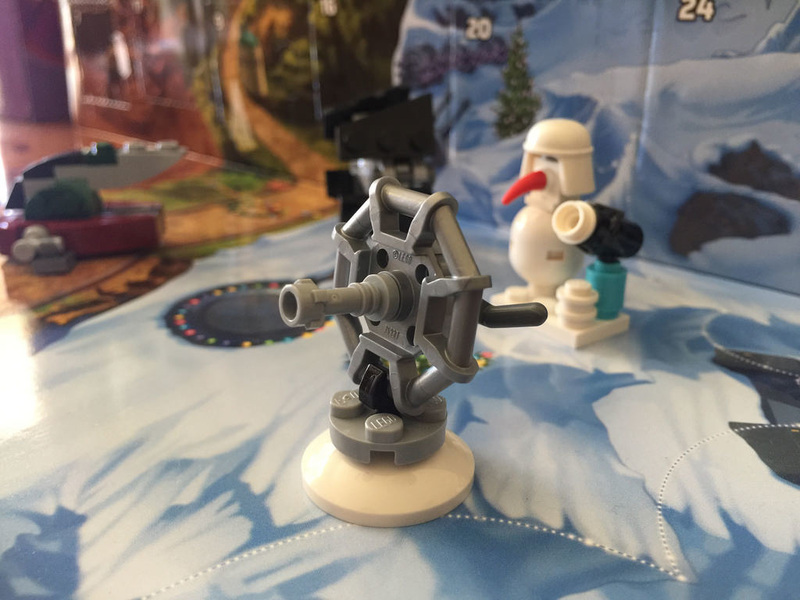 Every Star Wars advent calendar gets a special Christmas model, and he’s the one. 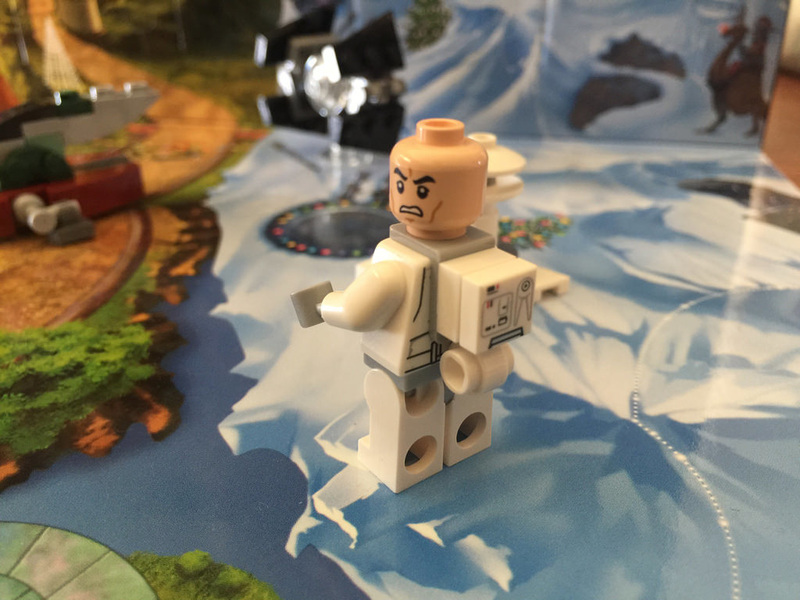 It also means you get the body parts for a completely white minifigure. 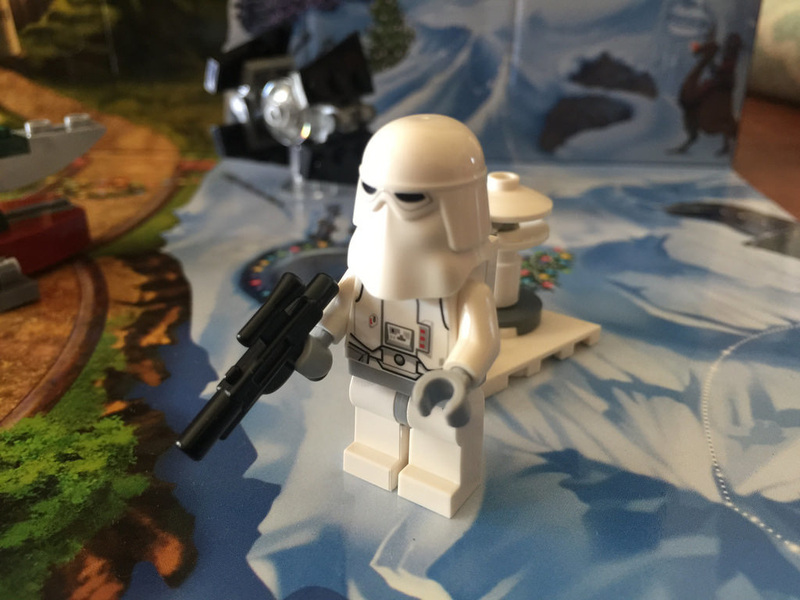 He comes with a bowcaster (from the Nexo Knights theme) and some little trees and spare ammo. 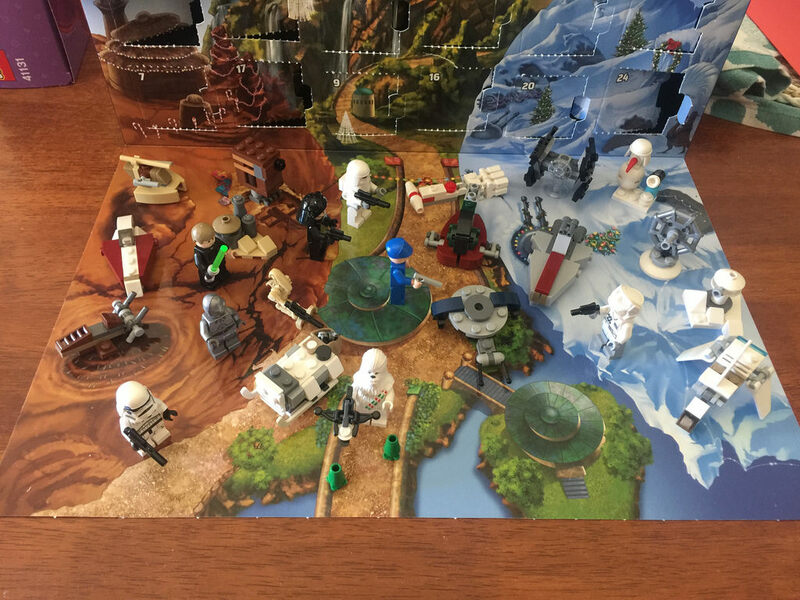 All in all, I think this Star Wars set has been top notch. 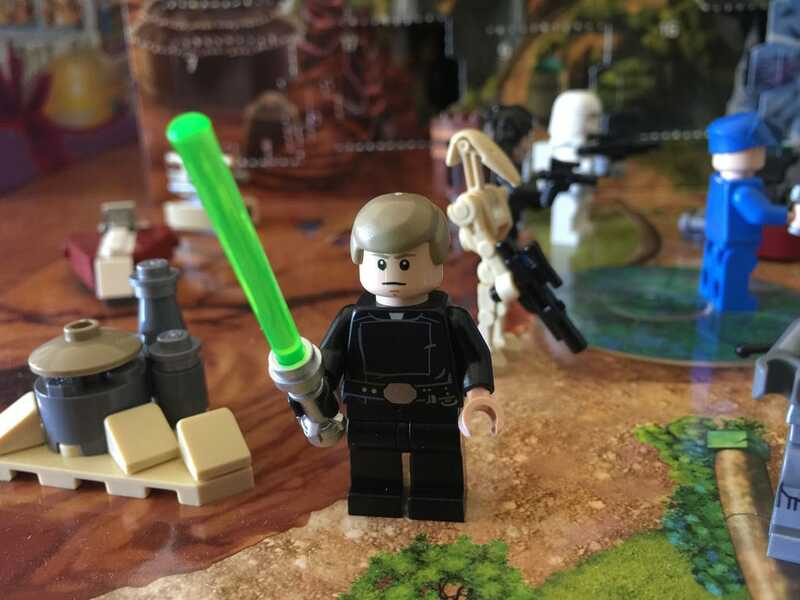 There’s been some amazing models (and some not so amazing ones), lots of space craft, lots of minifigures, and a whole lot of fun building them. 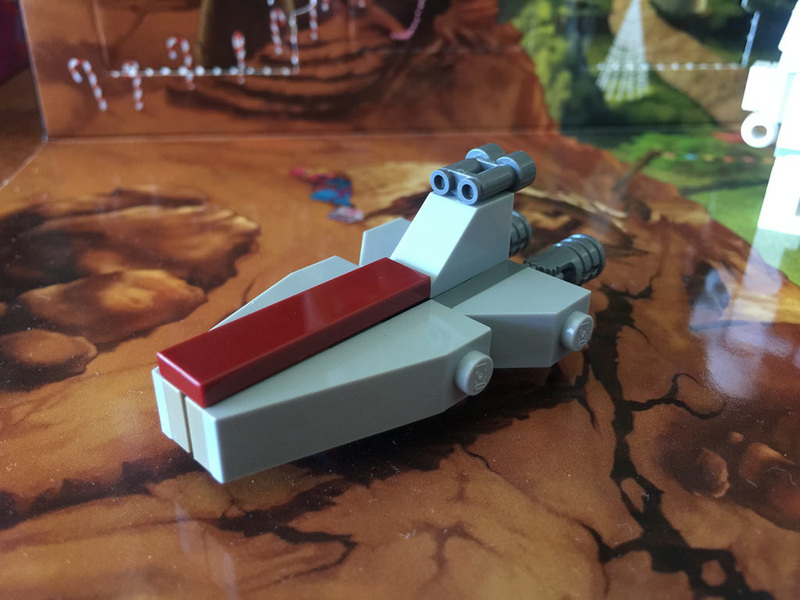 My favourite model has to be the Slave I from Day 1. What a way to start it off! This has been my favourite advent calendar to build this year, and easily my favourite for the past few years as well. I’m very excited for next year now! What’s been your favourite model from this year? What’s been the least favourite? Let me know in the comments below.